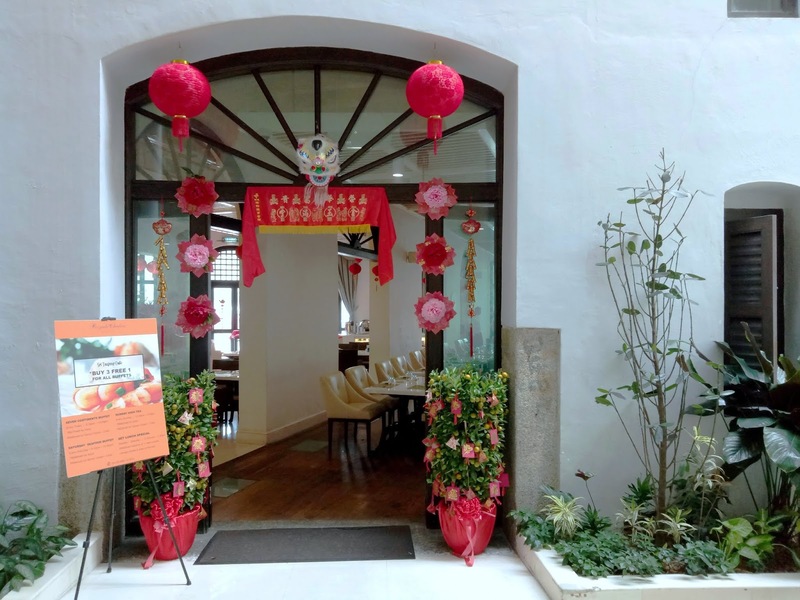 Located at the ground floor of Boustead Building, Sri Tanjung Cafe is the all-day dining restaurant of Royale Chulan Penang. 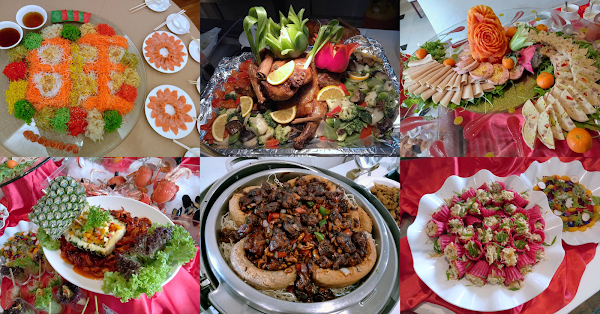 This evening, the hotel is showcasing its Fatt Choy Reunion Buffet Dinner. The actual dinner is supposed to be held in Sri Tanjung Cafe. But due to overwhelming response, the buffet will also be held simultaneously in The Royale Ballroom. 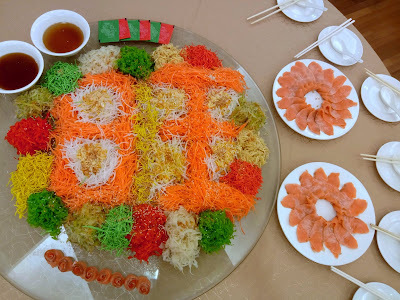 Tossing yee sang (鱼生) has become somewhat a must during Chinese New Year. 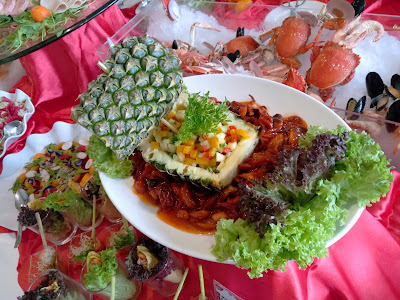 Yee sang is often served with fish such as salmon. 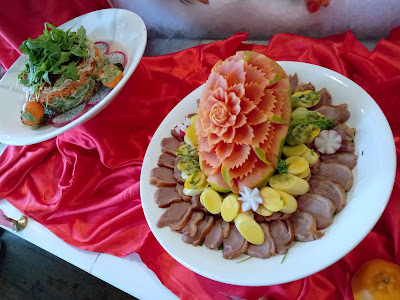 Fish is considered auspicious as it represents "abundance" (of wealth). Royale Chulan's Salmon Yee Sang uses colorful ingredients to spell the word "prosperity" (旺) in Chinese. 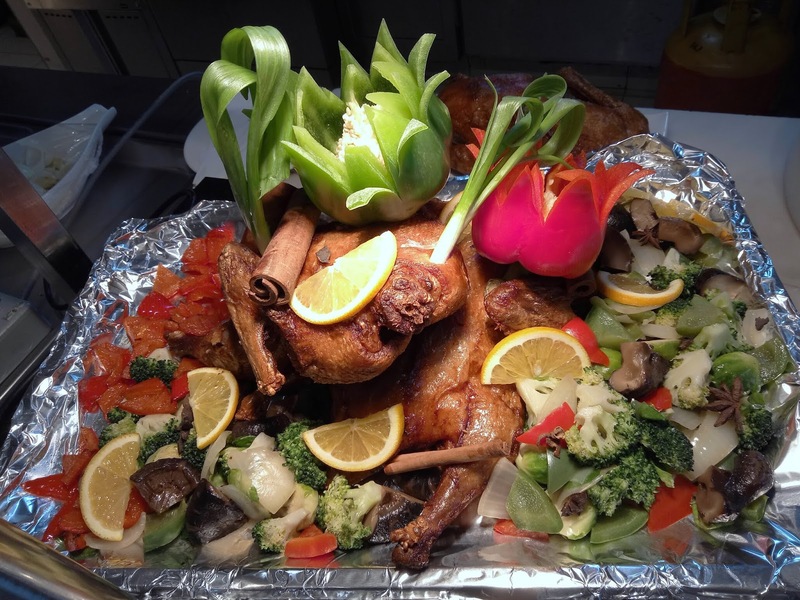 Roast Duck is one of the highlights this evening. Besides proper marinade, the duck is also given a waxy glaze to seal the moisture in. As a result, the duck's meat is tender and juicy. 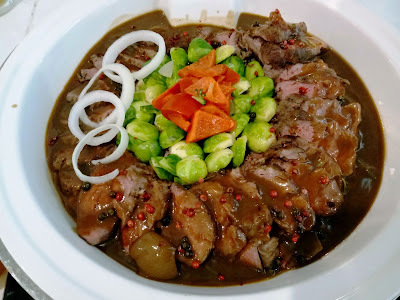 It goes very well with sweet-tangy plum sauce (苏梅酱). Grilled Minute Steak is served au jus. Premium quality tenderloin is used. Cooked to medium doneness, the beef has the perfect tenderness that delights my palate. The dish is seasoned with red, green and black peppercorns. Brussels sprouts, capsicum and onions serve as garnishes. 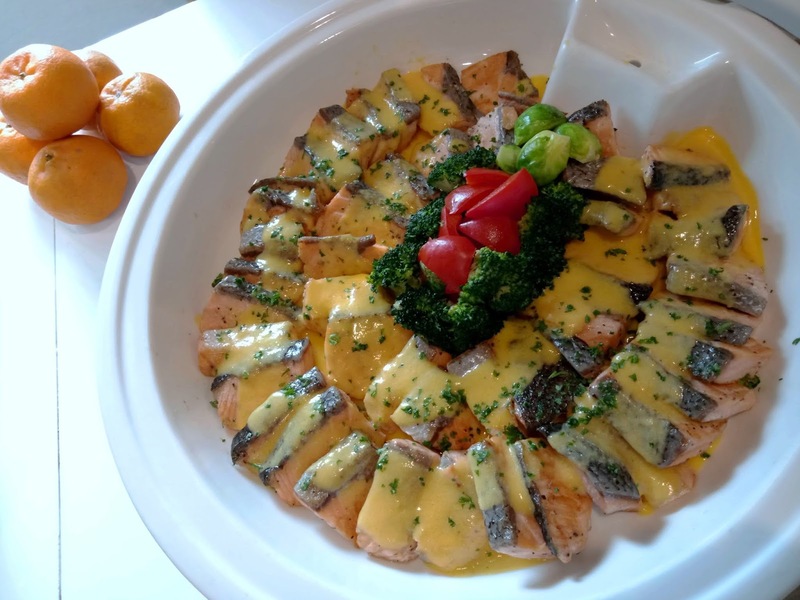 Another scrumptious dish is Grilled Salmon Fillet. The salmon's red flesh comes with crispy skin, adding an extra level of enjoyment in the mouth. The fillet is dressed with mandarin orange sauce. The sweet and tangy taste is rather satisfying. 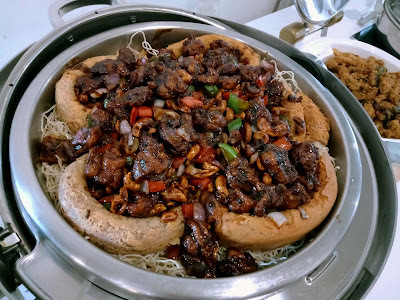 Stir-Fried Black Pepper Chicken is elegantly presented in an edible bowl made of taro. The chicken is served with cashew nuts, capsicum and shallots. I enjoy the fiery taste of black pepper sauce. Served on ice are chilled seafood such as crab, scallops, bay mussels and prawns. 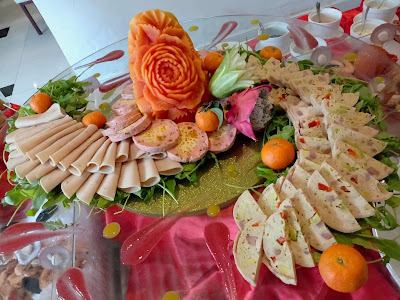 As for cold cuts, popular ones are Seafood Terrine and Chicken Pastrami. Marinated Spicy Baby Octopus is complemented by mango and pineapple salsa. This exquisite dish is presented in a "sailboat" made from pineapple skin. 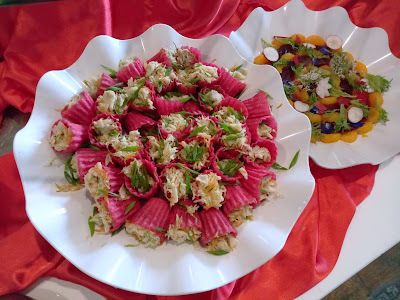 Other notable choices at the salad bar are Smoked Duck Breast, Prosperity Kerabu Mango Jellyfish and Orange & Beetroot Salad. Lunar Crab Salad is served in Nyonya-style "pie tee" cups. The pastry tart shells are dyed in auspicious red color, likely using beetroot juice as coloring. Consume this appetizer quickly before the cups lose their crispiness. 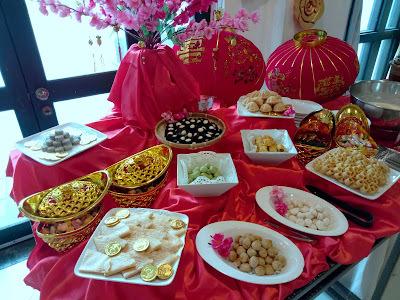 Chinese New Year is also an opportunity to savor a plethora of festive cookies. 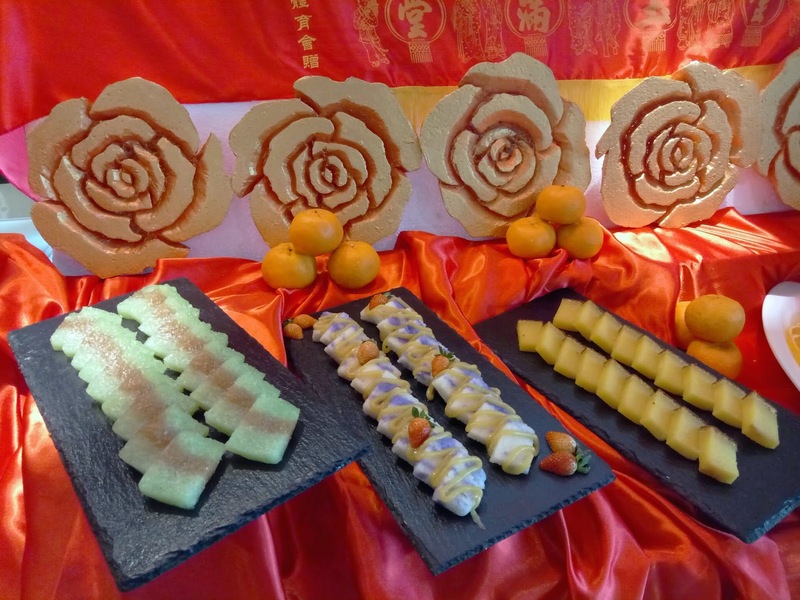 The choices this evening are love letters (鸡蛋卷), peanut cookies (花生饼), tapioca cookies (番婆饼), beehive cookies (蜂窝饼), almond cookies (杏仁饼), pineapple tarts (黄梨酥), bahulu (鸡蛋糕) and more. 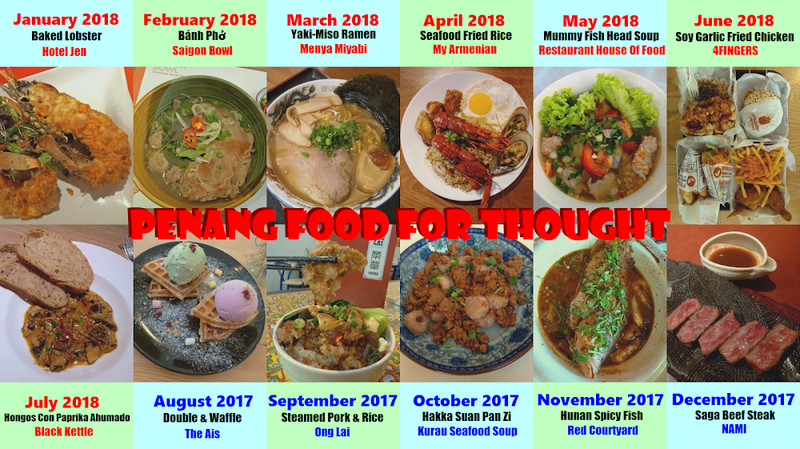 As for Nyonya kuih, seri muka (双色糯米糕), kuih sago (西米糕), pulut tai tai (咖椰蝶豆花糯米糕) and tapioca cake (木薯糕) are provided. Last but not least, Western-style desserts include chocolate mousse, crème brûlée, fruit jelly, fruit trifle pudding and coconut pudding. 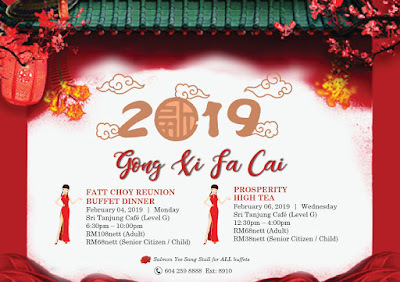 The Fatt Choy Reunion Buffet Dinner is priced at RM108.00 net per adult, and RM68.00 net per child or senior citizen. 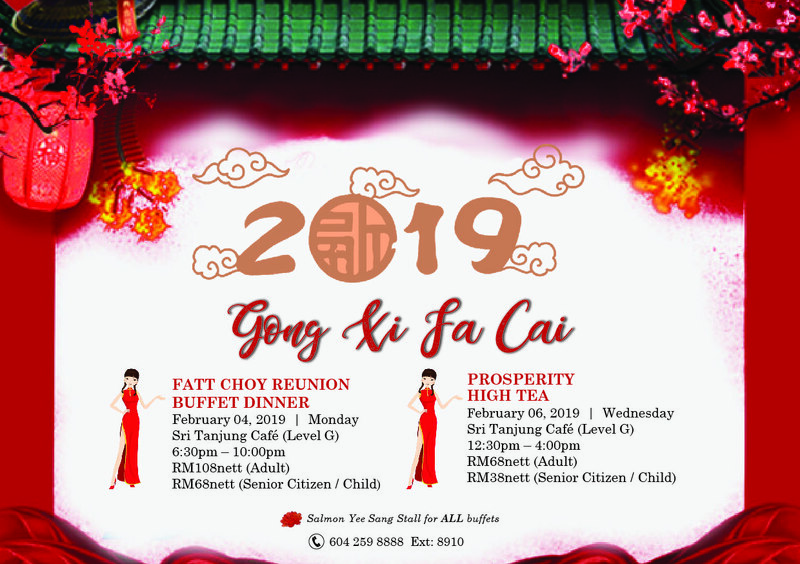 For those who are unable to join on Chinese New Year's Eve, Sri Tanjung Cafe is serving Prosperity High Tea on 6 February 2019. 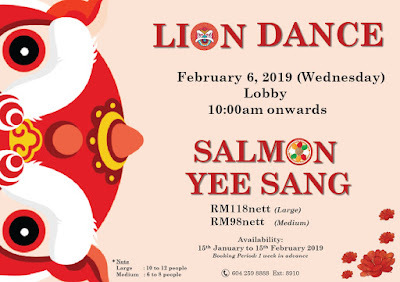 Diners are welcome to watch the lion dance performance at the hotel lobby at 10:00am. 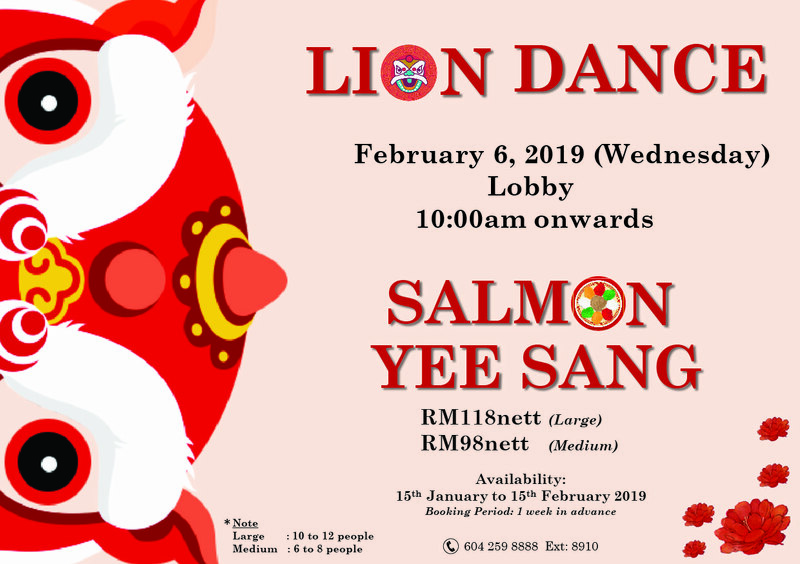 Salmon Yee Sang is also available à la carte between 15 January 2019 and 15 February 2019. 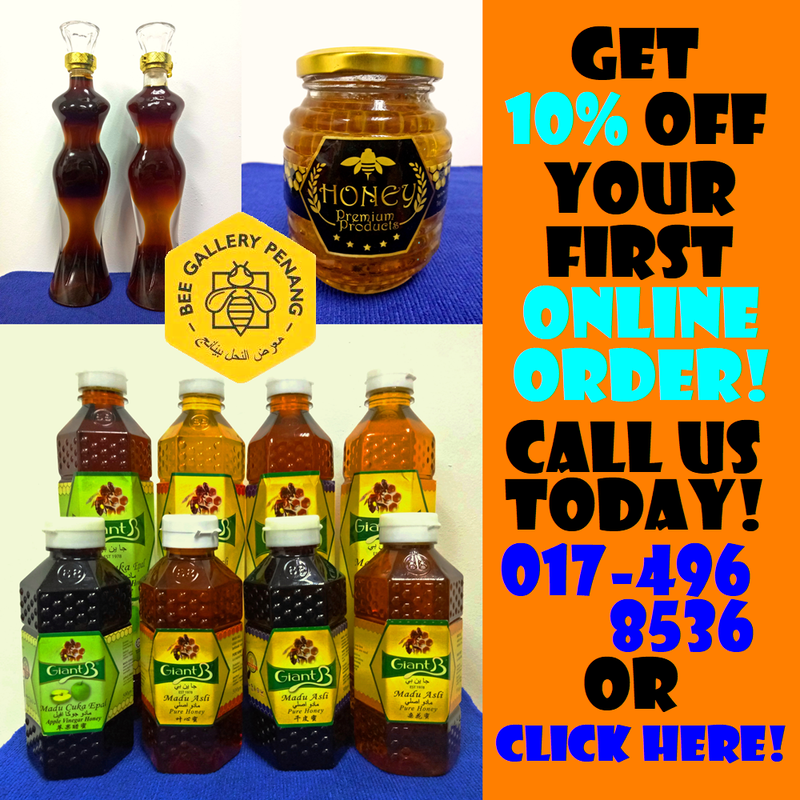 Two sizes are available: medium (for 6-8 people) and large (10-12 people). One week pre-ordering is required. 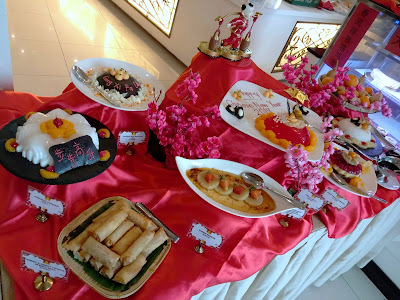 On the other hand, customers who prefer to dine in a more formal setting can opt for Royal Chulan's 8-course dinner. This promotion is available from 15 January 2019 to 19 February 2019. 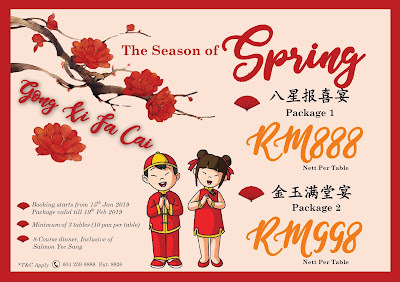 Diners can choose between two menus: RM888.00 net and RM998.00 net. Directions: From the ferry terminal at George Town, turn right and drive along Weld Quay (Pengkalan Weld). Royale Chulan Penang is located shortly on the left, at the same block as Made in Penang Interactive 3D Museum. There is a small lane right after the hotel, which leads to the main entrance and multi-level car park. Guests who dine in Sri Tanjung Cafe can get their parking tickets validated for a flat rate of RM5.00 per entry.